These is an extremely popular quesadilla stand, despite the picture. 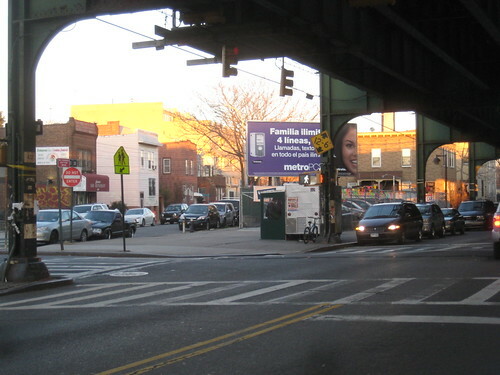 It is located on the triangle at 99th St and Roosevelt in Corona. Car Enchilada – I think this means carnitas enchiladas. Which would be spicy fried pork. It should be noted that Carnitas are more like fried pulled pork than just one pork chop on a taco. Memelas – Open faced corn tortilla with cheese, lettuce, black bean sauce and more. Similar to sopes or huaraches. (Some call it a Mexican pizza (I wouldn’t (I wouldn’t disintegrate the name of pizza like that))). More research needed. 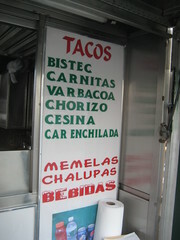 Chalupas – smaller, fried tortilla shells topped with a filling of your choice, probably cheese, salsa and more. More research needed. 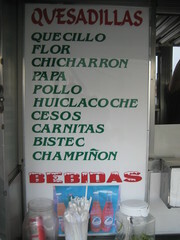 Bebidas are drinks which can be seen in the picture under the word. Every cart does it different. The world needs your help to describe these taco cart creations.